Art Dubai 2017 was held in partnership with The Abraaj Group, who celebrated their annual Abraaj Week alongside the fair, and was sponsored by Julius Baer, Meraas and Piaget. The fair took place at its home, Madinat Jumeirah. As the 11th edition of Art Dubai, in UAE came to a close, art from Africa made impressive business outing, adding to the unprecedented patronage at the fair. But what appeared like the most impressive outing for African art business at Art Dubai 2017 was achieved with the works of Ethiopian artist, Dawit Abebe. For ArtTalks, based in Egypt, the 11th Art Dubai was the gallery’s best outing at the Modern space. “Art Dubai 2017 is our first ever art fair, and we’re delighted with how it’s gone – we’ve sold 5 works, ranging from 1500 to 80,000 dollars,” said Cherine Chafik of ArtTalks. Highlights of this year’s fair included the unveiling of Rana Begum’s monumental winning work for the ninth edition of the Abraaj Group Art Prize, the eleventh Global Art Forum that focused this year on trade, the extensive programme of performances taking place around the fair and the commissions programme that included The Room by Atfal Ahdath and Meriem Bennani’s installation at the Art Dubai Bar. Outside the fair, Art Dubai’s Art Week programme, a testament to Dubai’s growing cultural scene, had a record number of 150 participants hosting over 350 events across the city. Highlights included the sixth edition of Design Days Dubai, Sikka Art Fair and 27 gallery exhibitions in Alserkal. Art Week also saw the announcement of the opening of the Jameel Arts Centre, one of the first major not-for-profit contemporary art institutions in Dubai, due to open at the end of 2018. 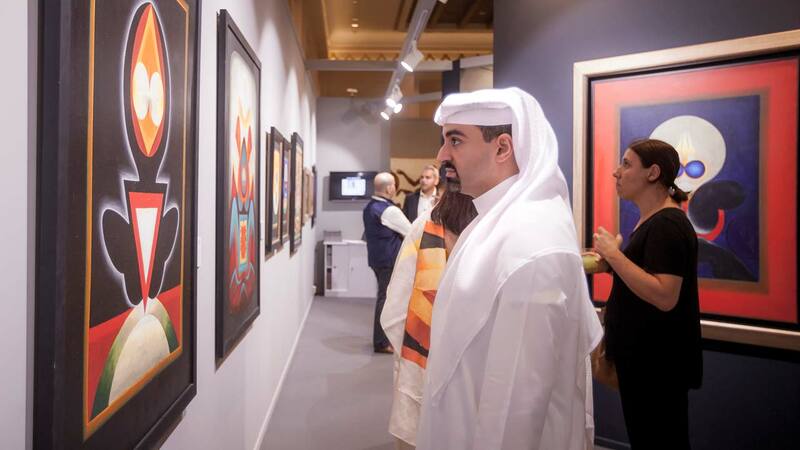 The centre was seen to be active at the fair adding both Middle Eastern and international artists to the Jameel Art Collection. edition since the beginning of the fair over 10 years ago, the organisers stated.. Other features of the fair included The Global Art Forum, which explored the theme of trade. Over 1,200 students visitedthrough the fair’s schools and colleges’ programme, and more than 700 children participated in the Sheikha Manal Little Artists Program. Held under the patronage of His Highness Sheikh Mohammed bin Rashid Al Maktoum, Vice President and Prime Minister of the UAE and Ruler of Dubai, the 11th edition was inaugurated by His Highness Sheikh Hamdan bin Mohammed Al Maktoum, Crown Prince of Dubai, in the company of dignitaries including His Excellency Sheikh Nahyan bin Mubarak Al Nahyan, His Excellency Ahmed bin Saeed Al Maktoum and His Excellency AbdulRahman Bin Mohamed Al Owais.